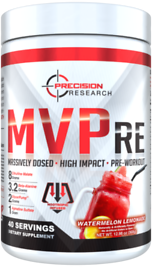 Precision Research (InnovaPharm Subsidiary) MVPre is a fully loaded, 2-in-1 massively dosed PUMP & HIGH STIM pre-workout formulated to help give you the most intense workouts of your life! As a dietary supplement, consume 1 scoop mixed with 10-16 oz of water on a relatively empty stomach approximately 15-30 minutes before exercise. To assess tolerance, users may wish to begin with 1/2 scoop. DO NOT EXCEED 1 SCOOP IN ANY 24 HOUR PERIOD.